Today really feels like summer is over for me. It's the first full week of school, our after-school nanny starts today, I'm back to my old schedule at work. It was chilly at night-time a couple days ago so I remember what the cool air feels like. I didn't feel quite as sad sending the girls back this year. I think it's partially because we had such a great summer that I don't feel like we left anything undone. 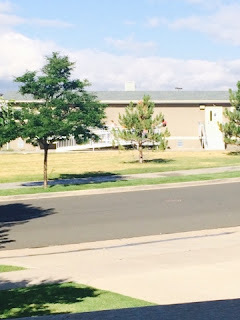 I'm proud that Mr. Quimby and I made it that way for them: summer swim team was SO good for them, fun times with an afternoon babysitter, lunch at home with Mr. Q. or me everyday, plenty of time to get bored and time to have extra electronics time too. It was hard on us with all the travel and schedule changes, but it was really great for them. As a fluke, Mr. Q and I only had a little bit of work travel from mid-June - late August and that made a difference too. I love their class placements, and I feel like they were done so thoughtfully. Beezus can handle pretty much any teacher and she got one that is young-ish and VERY energetic. She has a fellow "good girl" in her class and I think it will be so good for her to not have to bear the burden of being the "teacher's pet" alone. Ramona has the perfect teacher for her (and for our family) as we try to figure out what is going on inside her head. Beezus runs out the door and across the street to her "cabin" aka portable classroom that has been permanent for 8 years. She will only make brief eye contact when she sees us walk Ramona over. Mr. Quimby is out of town today and as Ramona was leaving she said: "Don't you dare walk me to school." (She's such a sweet, genteel, little flower of a young lady.) I said: "Okay." As she was walking out the door, she muttered: "You better hurry up and come with me. I don't want to be late." Then she gave me the sweetest hug and kiss at the door. That pretty much sums up my relationship with them these days! It's hard for me sometimes how Beezus runs so hot and cold - but it makes it easier to bear when I know that she is SUPPOSED to be acting like this. At least we don't miss seeing them. This is a view of Beezus' classroom from our front porch!